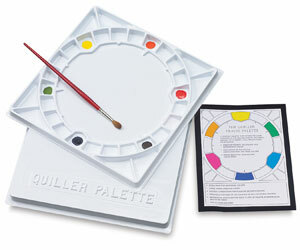 The Stephen Quiller Color Wheel Palette is arranged for ease of accurate mixing of primary, secondary, and intermediate colors. Indicator guides on the palette aid in locating analogous, complementary, and triadic color relationships to ensure fresh, beautiful, and harmonious color mixes. The palette includes 12 extra pans around the wheel for other favorite colors, 8 outside corner basins to place earth colors or opaque water media, and a very large inner-wheel mixing area. It measures 14" × 14" (36 cm × 36 cm). Also included is an instruction guide on how Stephen Quiller arranges colors on the palette, on how he makes full use of this outstanding palette. ™ Stephen Quiller is a trademark.